The exigencies of war is oftentimes very unkind to mankind's cultural heritage, but especially so when its a historic battlement structure. Fakhr-al-Din al-Ma'ani Castle, which sits on a high hill overlooking the UNESCO World Heritage Site of of Palmyra in Syria is thought to have been built by the Mamluks. This newly-liberated castle gets its current name from the Lebanese Maanite Emir, Fakhr al-Din (1590 - 1635), who himself is believed to have occupied the castle strategically during wartime and having extended the present structure from an earlier castle which stood on the rocky outcropping, perhaps dating from the 12th century. 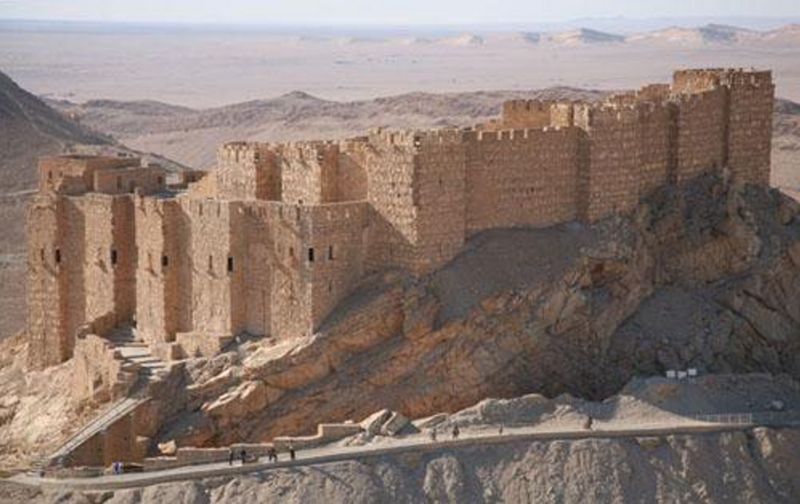 Fakhr al-Din used the castle for a military vantage point to defensively test the limits of Ottoman rule, having expanded his area of territorial control from Mount Lebanon to as far east as the deep Syrian desert. Things didn't turn out so well for al-Din either as he was ultimately captured and subsequently executed by the Ottomans in 1635. In evaluating the impact of the the current conflict on Syria’s cultural heritage, especially the use of heritage with tactical value like the Fakhr-al-Din al-Ma'ani Castle, there is much to consider legally. The term ‘armed conflict’ is context-dependent in that the criteria for determining the existence of an armed conflict differ according to whether the armed violence is one fought between two or more states. An international armed conflict (IAC) is defined by criteria derived from Common Article 2 of the 1949 Geneva Conventions as being between one state and one or more organised non-state armed groups. A non-international armed conflict (NIAC) is defined by criteria derived from treaty law as well as key ad hoc tribunals. The term is used when a situation of violence involves one or more organised non-state armed groups or between two or more such groups. When a conflict is deemed to be a NIAC it triggers the application of the law of armed conflict (LOAC). LOAC and international humanitarian law (IHL) are often used interchangeably. The extent and sustained nature of armed violence, and the level of organisation of the various non-state armed groups fighting against one another or the current Syrian governing authority, have defined the situation across Syria as an NIAC as an armed conflict of a non-international character as of 2012. (See the assessment made by the International Committee of the Red Cross --ICRC). 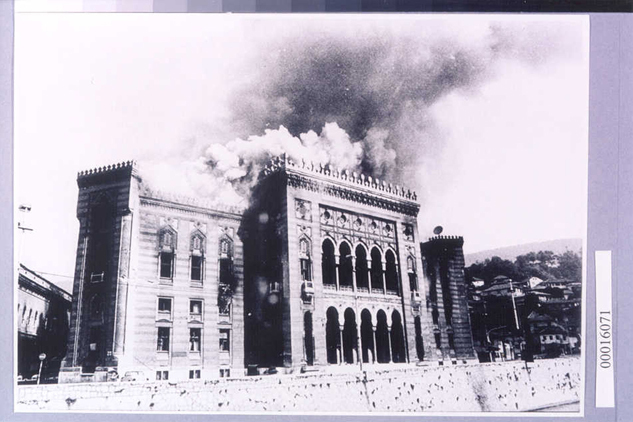 Under the Hague Convention, as an official state party to the Convention and the First Protocol, the Syrian government is obliged ‘respect’ cultural property in their or other territory. 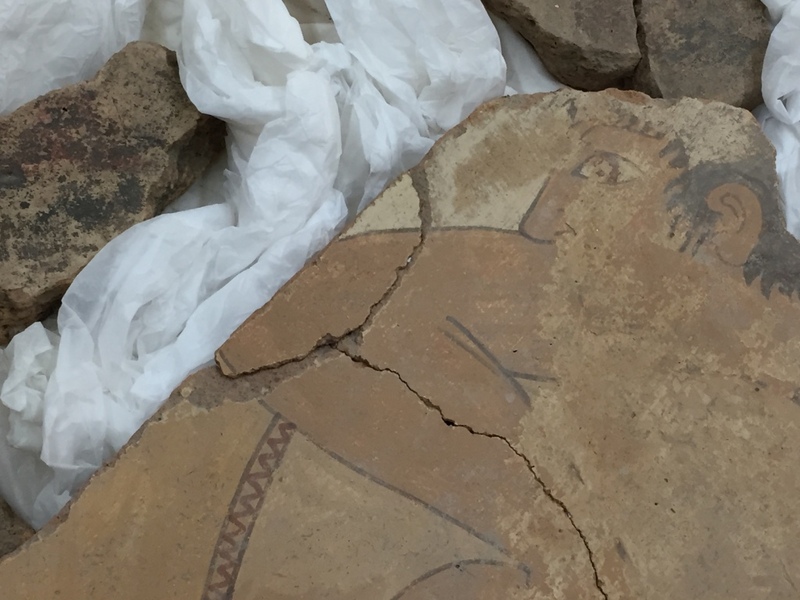 The Convention prohibits their targeting cultural property, unless it is of ‘imperative military necessity’, a term subject to differing interpretations. 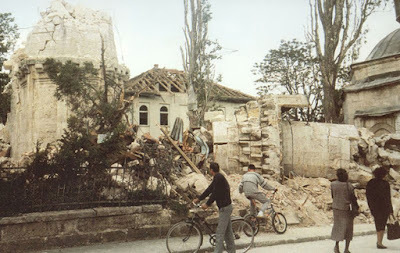 When a site is exploited by non-State actors, in situations where those structures prove to be militarily strategic to the opposing force, state military actors are still obliged to take into consideration precisely what substantive content of international law does and does not apply if targeting the site during wartime. The Second Protocol, which Syria is not a State Party to further elaborates the provisions of the Hague Convention relating to safeguarding of and respect for cultural property and the conduct of the military during hostilities. Both the First and the Second Protocols lead to the question of applicability of customary international law, of other sources of international law and local law and what they require of waring parties. The collection of images below show one example of how one heritage site, specifically one with battle attributes that are considered militarily valuable to waring factions, can become a cultural causality of war. Whether that damage was ‘imperative military necessity’ is something that will be debated for years to come. Inside the structure there are several levels and numerous rooms. The best (and also most vulnerable) Military vantage points are from from the highest terrace to the south. Images of the bridge, replacing the original drawbridge, which gives access over the moat to the castle gate. 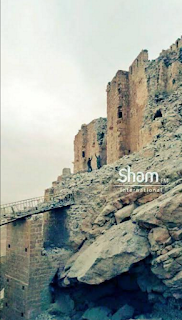 Russian war correspondent Eugene Poddubny from Rossiya 24 TV has posted news footage taken with a quadcopter drone while embedded with with SAA + allies over the UNESCO World Heritage Site of Palmyra. While the speaker narrating the video gets some of the identifications wrong, the images are heartening to see. 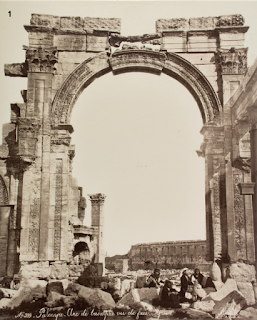 Clearly visible is the reconstructed Great Tetrapylon Dr. Khaled al-Asaad's team unearthed during the Palmyra Development Project from 1962 to 1966. The video also gives an overall view of the Colonnaded Street from Diocletian's Camp, the transversal colonnade and the 2nd century CE, Roman theatre each of which appear relatively intact. Missing obviously are the majestic Temple of Bel, once the centre of religious life in ancient Palmyra, the historic Temple of Baalshamin and the Arch of Triumph as well as the ancient tower tombs which were symbolically detonated by Da’esh last year. 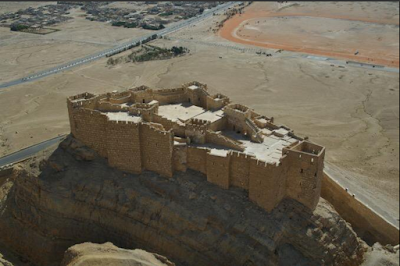 Another drone video shows the mostly still preserved Fakhr-al-Din al-Maani Castle (1590 - 1635). 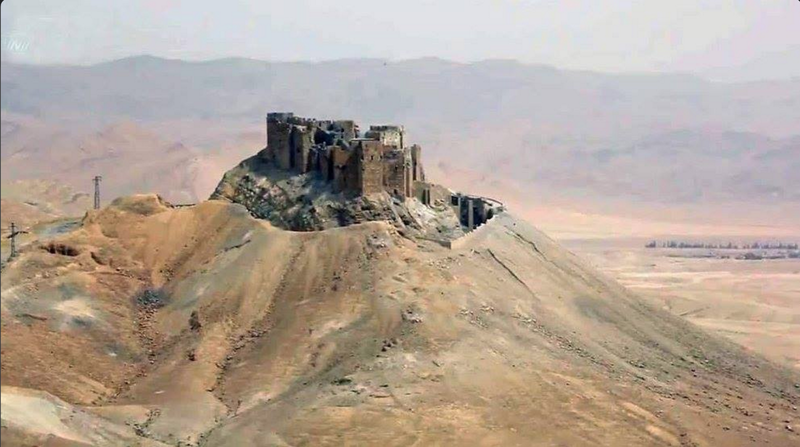 Throughout the afternoon Wednesday Syrian government forces backed by Russian airstrikes advanced in central Syria seizing high ground within a few kilometres to the west and the south of Fakhr-al-Din al-Maani Castle. 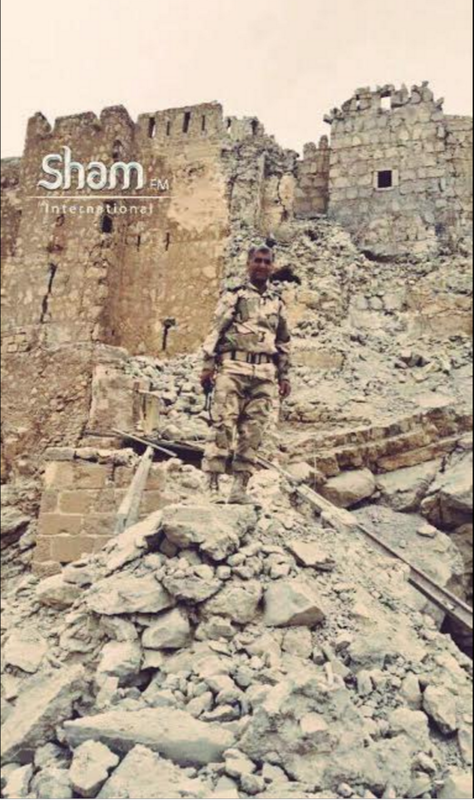 Positioning themselves to recapture Tadmor and the ancient archaeological site, advance detachments of the Syrian government army have allowed news correspondents from Alikhbaria Syria TV to accompany them and film the military's preparations to retake the city over the last two days. produced by Félix Bonfils between 1867 and 1876. 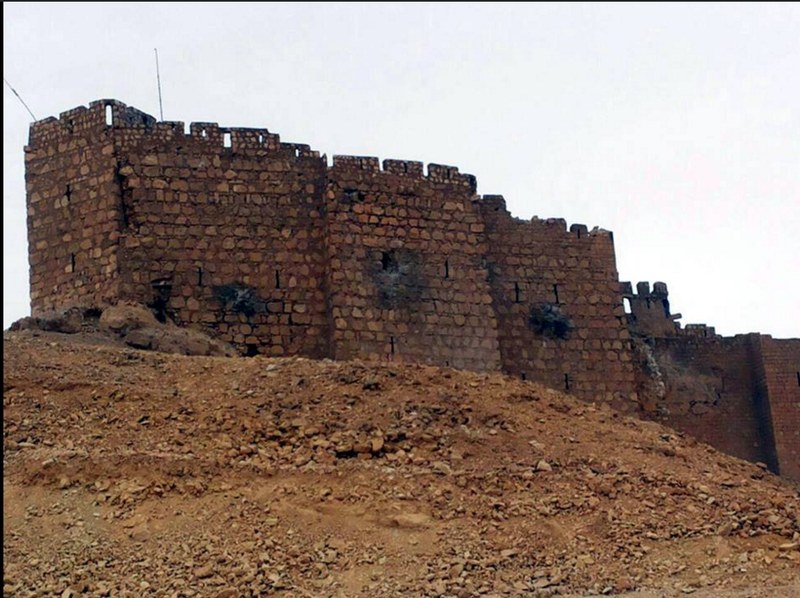 The governor of Homs province, Talal Barazi, has speculated in the press that the military would recapture Palmyra within two days. 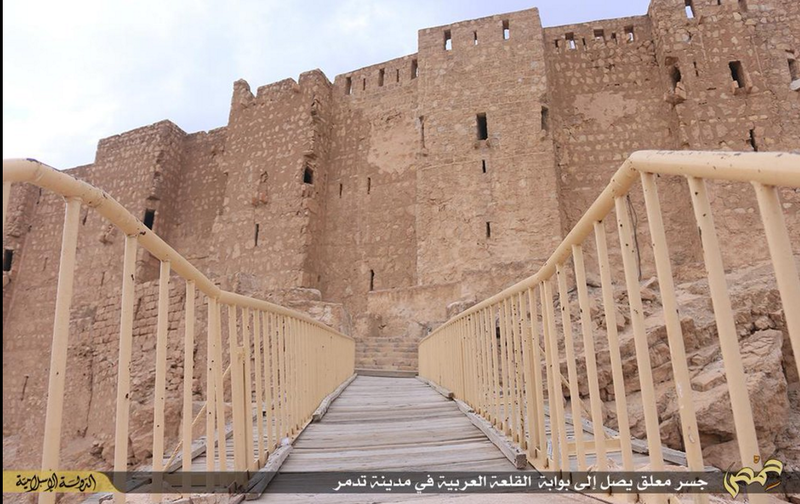 In the afternoon, the government forces managed to fully capture the Semiramis Hotel as well as Mount Muthar and the Mozeh Palace, a once luxurious Qatari-owned villa which ISIL used during the occupation as a staging facility. 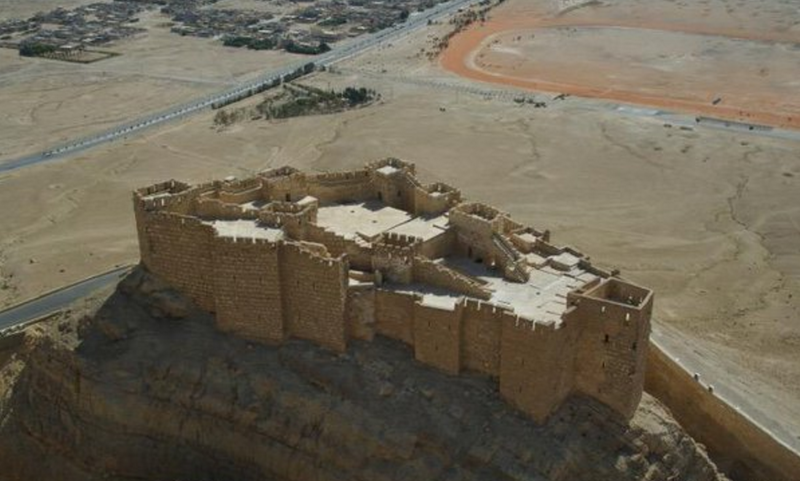 Nestled deep in the Syrian desert, the recapture of Palmyra is seen as a strategic as well as symbolic victory for the Syrian government, as control of the terrain surrounding Palmyra's magnificent 2000 year old ruins would provide government forces with a tactical advantage in the ongoing conflict. By controlling the areas southwest of Tadmor the SAA would also control large swaths of the surrounding desert extending to the Iraqi border affecting supply lines. 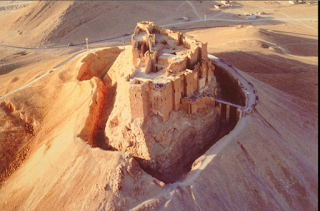 The government's strategy to retake the city from two sides, vs. a siege approach (encircling the city in order to block reinforcements and the subsequent escape of Da'esh militants) may have been decided upon to avoid urban warfare and to afford some limited protection, if possible, to what remains of the magnificent ruins of the UNESCO World Heritage Site. 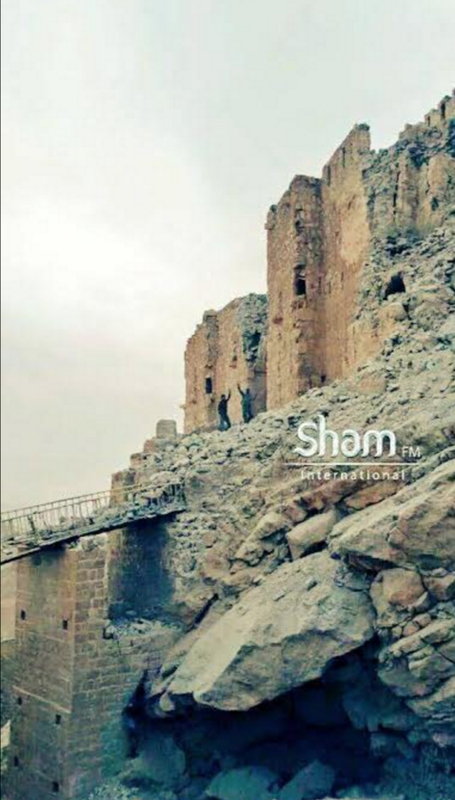 By giving the Islamic State forces an exit route the Syrian government forces may be attempting to reduce the possibility of desperation-provoked destruction of the archaeological site while forcing the insurgents into unprotected open territory and theoretically away from civilians, though ISIS had been broadcasting in Tadmur for civilians to leave the city, meaning fleeing fighters could be interspersed with fleeing civilians. 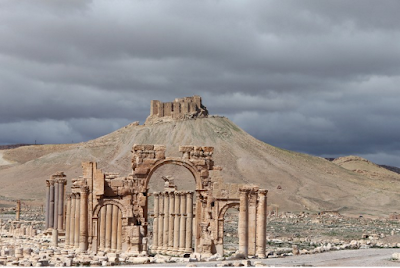 The Director-General of the United Nations Educational, Scientific and Cultural Organization (UNESCO), Irina Bokova, welcomed the pending liberation of the Palmyra archeological site. 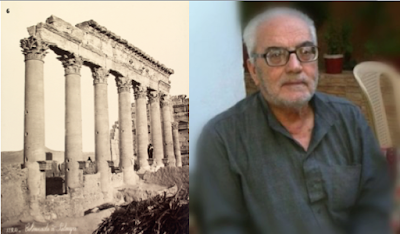 In a statement issued by her office she said the city “carries the memory of the Syrian people, and the values of cultural diversity, tolerance and openness that have made this region a cradle of civilization,"
The Director-General of Antiquities and Museums in Syria Maamoun Abdulkarim expressed his joy Thursday at "the imminent liberation" of the ancient city of Palmyra from the hands of extremists stressing that he will rebuild the temples jihadists had destroyed. 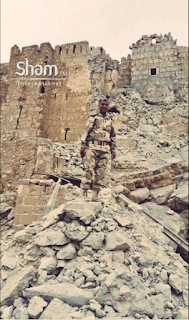 "During the recent few days, the Syrian armed forces has started the battle to restore the city, confirmed information state that the city is being surrounded by both the western and west-southern sides, in preparation to gain control back on the city. Upon restoring the city, experts for DGAM will directly plan a field visit for damage assessment, with the collaboration of local and international partners, i.e. 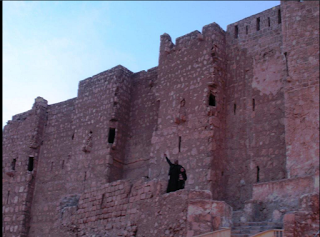 UNESCO, ICOMOS, and ICCROM, as the city is enlisted on the World Heritage List. As previously adopted by DGAM, plans of restoration and rehabilitation should also be prepared consequently in order to open the site back to its residents and visitors as soon as possible. We, at DGAM, will do our best to carry a cultural, intellectual, and human message that Palmyreans have always presented to the world, a message of tolerance and multicultural richness, the things that the militants of ISIS hates." 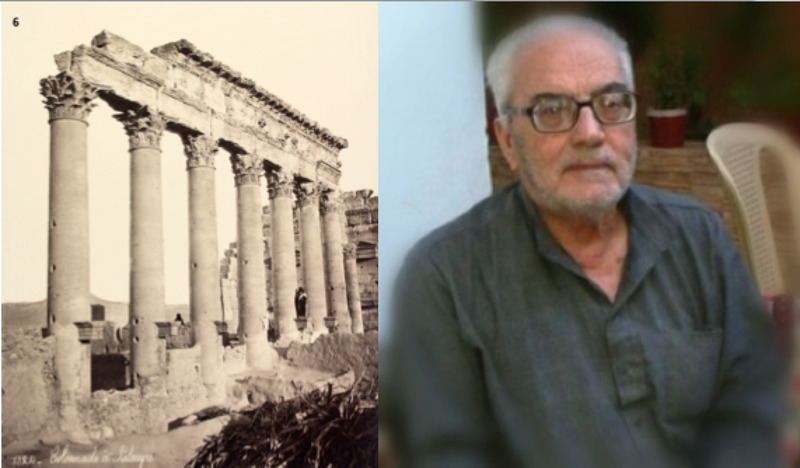 Given the emotional response to the murder of Khaled al-Asaad, a university professor and the former general manager for antiquities and museums at Palmyra, who gave his life in defence of Syria's culture, it is easy to understand Dr. Abdulkarim's commitment and those of his staff, to securing and conserving the ancient historical site. 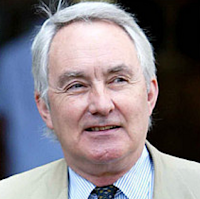 Robin Symes, was once one of London's best-known and most successful dealers in antiquities. For 30 years, he and his partner Christo Michailidis were inseparable as two of the movers and shakers in the global antiques trade. 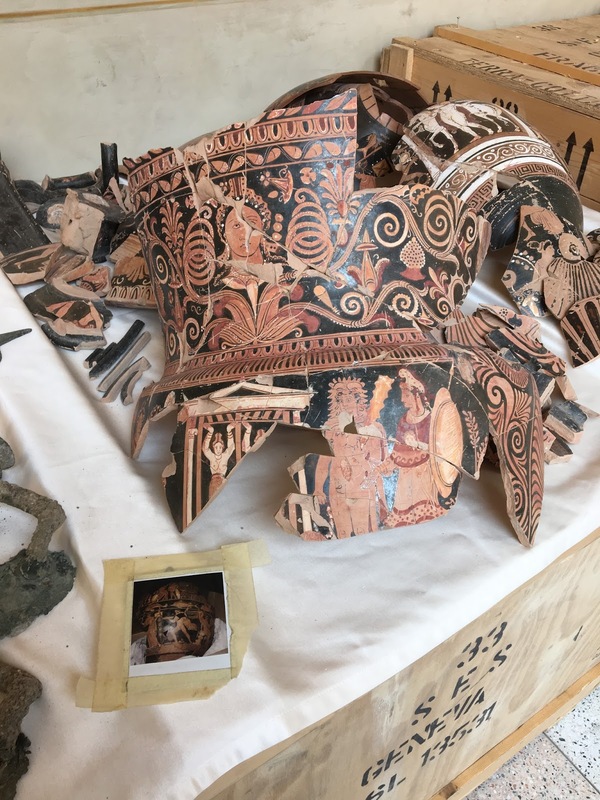 Collecting property in London, New York and Athens, and fancy cars as well as antiquities, the two procured ancient artefacts for, and wined and dined with, the rich and famous, including well-known antiquities collectors Leon Levy and his wife Shelby White. Building one of the world's largest ancient art businesses, Symes and Michailidis pieces also became part of museum collections around the globe, including the J Paul Getty Museum, the Minneapolis Institute of Arts and the Metropolitan Museum. At the height of their enterprise Italian authorities estimated that the pair's jointly-run ancient art business earned them an estimated 170 million euro but a series of missteps proved the dealers' undoing, literally and figuratively and in 2005 Symes served a very brief jail sentence for disregarding court orders over the sale of a £3m Egyptian statue. In 2006 Symes was further implicated as being part of one of the most sophisticated illicit antiquities networks in the world in a book“The Medici Conspiracy: The Illicit Journey of Looted Antiquities from Italy's Tomb Raiders to the World's Greatest Museums” by Peter Watson and Cecelia Todeschini. 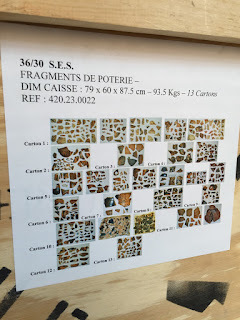 The Medici Conspiracy outlined Symes' assets which included thirty-three known warehouses encompassing some 17,000 objects worth an estimated £125 million ($210 million) as well as his ties to traffickers in Europe's illicit antiquities trade. Each of the museums mentioned above were subsequently forced to relinquish looted objects that had been laundered illegally and which at one time had passed through networks connected with Symes. 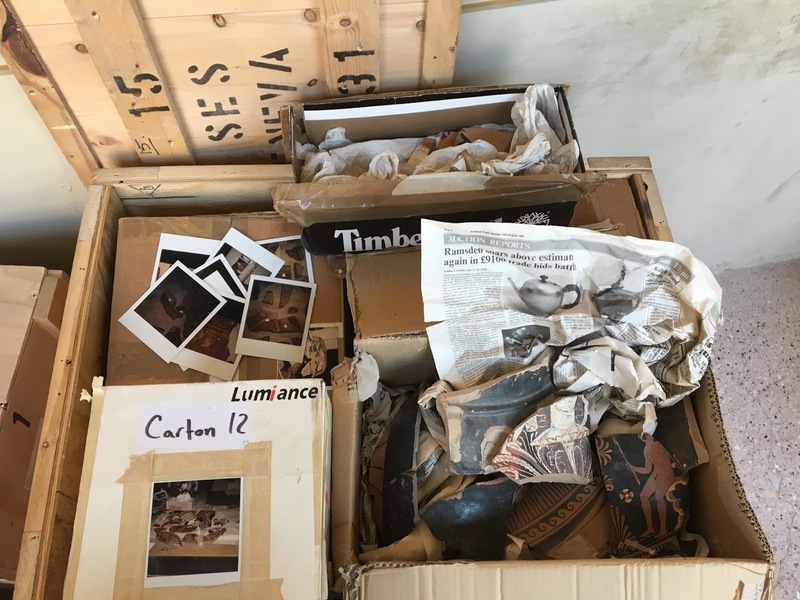 In addition to requests for museum repatriations, the Italian government has also gone after collectors who have purchased Symes-tainted art for their individual private collections. In November 2006 they asked Syme's client and friend New York collector Shelby White to return more than 20 objects from the Levy-White collection looted from southern Italy. An avid collector and philanthropist, White had donated $20 million to financing for the Metropolitan's expanded wing of Greek and Roman art. That same year she made a $200 million gift of cash and real estate to New York University via the Leon Levy Foundation to finance the University's Institute for the Study of the Ancient World (ISAW). After 18 months of intense negotiations, White ceded ten classical antiquities to the Italian government from the Shelby White and Leon Levy private collection. One of the ten objects was an attic red-figured calyx-krater depicting Herakles slaying Kyknos, signed by the celebrated fifth-century B.C. painter Euphronios. This object had once been on extended loan to the Metropolitan Museum. Discussed in Watson and Todeschini's book, (pages 128-32) and illustrated in J. Boardman's “The History of Greek Vases”, (fig. 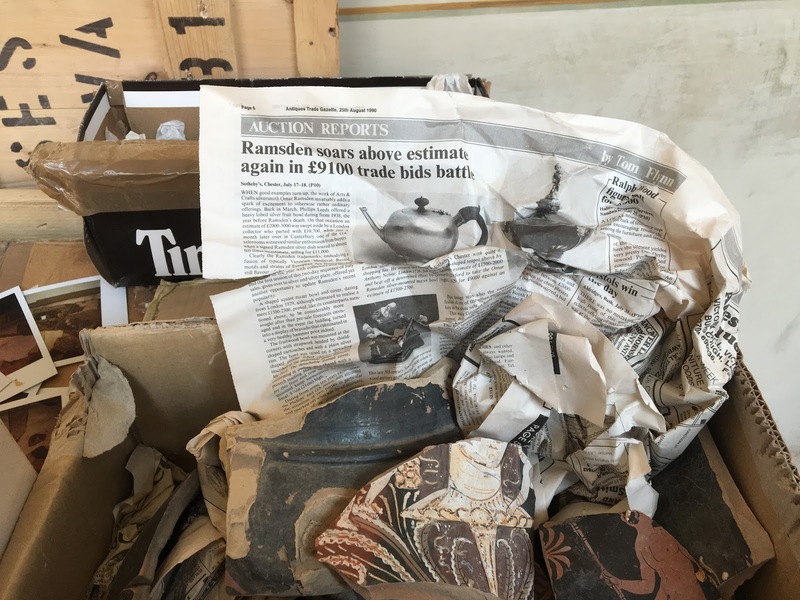 120), the calyx-krater vessel had been laundered through the hands of tainted antiquities dealers Giacomo Medici, Bob Hecht and Robin Symes before finally coming to rest within the White/Levy collection. Polaroids held by the Italian government used in the investigation clearly show the object broken into pieces with dirt still clinging to the vase fragments. Another returned Shelby White and Leon Levy object was a small bronze statue purchased through Symes for 1.2 million dollars in 1990. The bronze had been displayed during the exhibition “Glories of the Past: Ancient Art From the Shelby White and Leon Levy Collection”, a presentation of over 200 objects from the couple's ancient art collection on view at the Metropolitan Museum. Italian authorities traced this bronze to Symes via thirteen photographs seized through convicted antiquities trafficker Giacomo Medici. The photos showed the statue also covered with dirt during the early stages of its trafficking from tombarolo to the collections of the wealthy. But despite academic pressure regarding the many tainted pieces in their collection, Ms. White has steadfastly maintained that she and her husband, who died in 2003, purchased their artifacts in good faith and had no knowledge that objects within their collection included those which were clandestinely excavated and trafficked out of source countries. Given White's roll in the formation of ISAW, which on its website states is "a center for advanced scholarly research and graduate education, which aims to encourage particularly the study of the economic, religious, political and cultural connections between ancient civilizations" it seems unusual that a seasoned collector of White's caliber would not have understood the implications of an object's collection history prior to purchasing high-end antiquities, especially given the hefty price tags that accompanied many of the family's ancient art acquisitions. But back to the dealer Symes himself. When prosecuted for some of his offences, Symes lied to the court and claimed that he had stored his antiquities in five warehouses. It later transpired that he had secretly stashed items in more than 30 warehouses, peppered between London, New York and Switzerland, some of which the authorities are continuing to search for. One of these storage facilities was the subject of a closed door press conference in Rome on March 22, 2016. When seasoned officers from Italy's Art Policing division, the Comando Carabinieri per la Tutela del Patrimonio Culturale pried open forty-five large wooden shipping crates at a Port Franc freeport warehouse storage facility in Geneva in January 2016 they were shocked by the contents they found. Carefully inventoried, complete with dated newspaper wrappings, was enough ancient art to fill a museum: 5,300 objects spanning 1500 years of Italian archeology. In one singular warehouse, stashed away for 15 years, the British art dealer had squirrelled away an Ali Baba's cave-worthy hoard of Roman and Etruscan treasures. 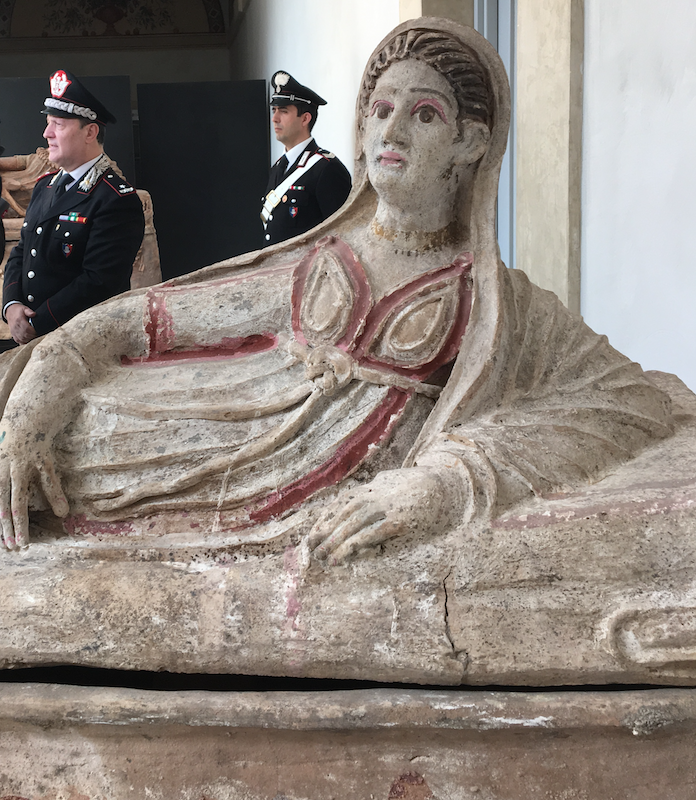 Among the objects were two exceptional sixth century BCE Etruscan sarcophagi looted from Tuscania; one of a reclining young woman with pink painted eyes and another of an elderly man. The crates were also filled with bas-reliefs and a cache of fresco fragments, some of which are believed to have come from a painted from a temple of Cerveteri, perhaps from the Vigna Marini Vitalini. 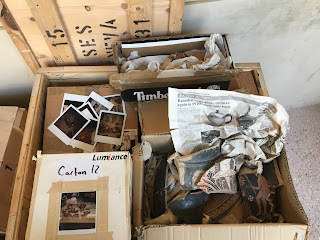 Whoever packed the crates methodically catalogued each of the box's contents, pasting a photocopy of the images of the contents to the exterior of each shipping container. Many of the art shipping containers contained an impressive quantity of attic pottery, painted plates, marble busts and bronzes. 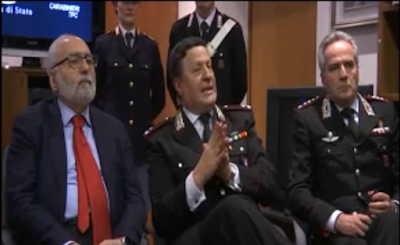 During the press conference at the Carabinieri TPC barracks in Trastevere Italy's Minister of Cultural Heritage and Activities and Tourism Dario Franceschini, Italian deputy prosecutor Giancarlo Capaldo, superintendent for Southern Etruria Alfonsina Russo and the head of the Carabinieri TPC Division, praised the coordinated efforts of the Swiss and Italian investigators. 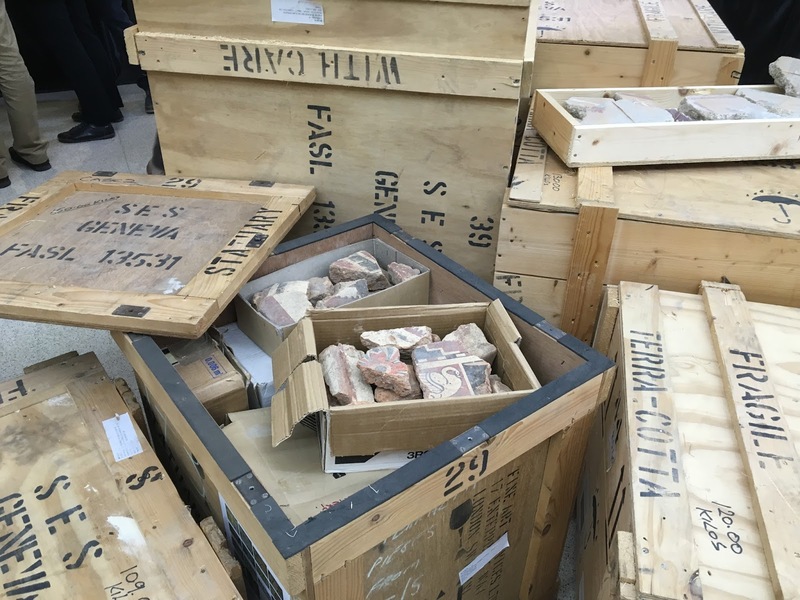 General Commander of the Carabinieri TPC, Mariano Mossa estimated the value of the objects discovered in the warehouse to be worth nine million euros. 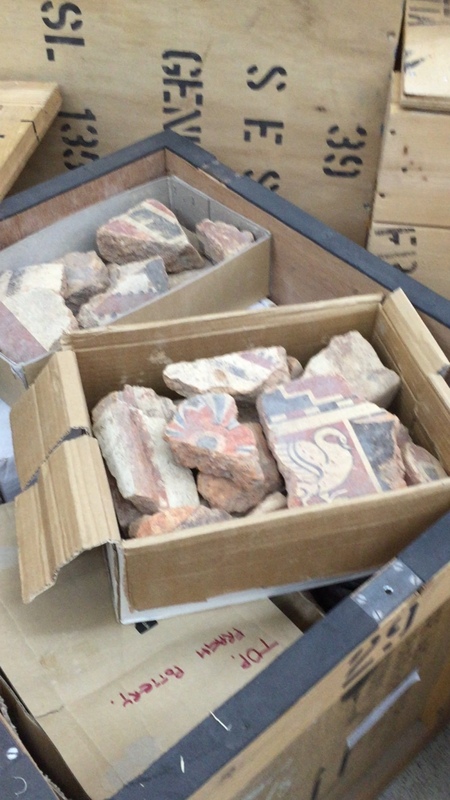 Culture Minister Franceschini called the warehouse raid "one of the most important finds of recent decades". Prosecutor Giancarlo Capaldo stated that the objects were stolen in the seventies, in clandestine excavations in Campania, Calabria, Sicily and Puglia as well as looted in Etruria. 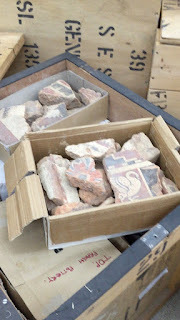 At some point in the looting campaign, the antiquities were smuggled into the Geneva freeport facility where they remained untouched and unopened. 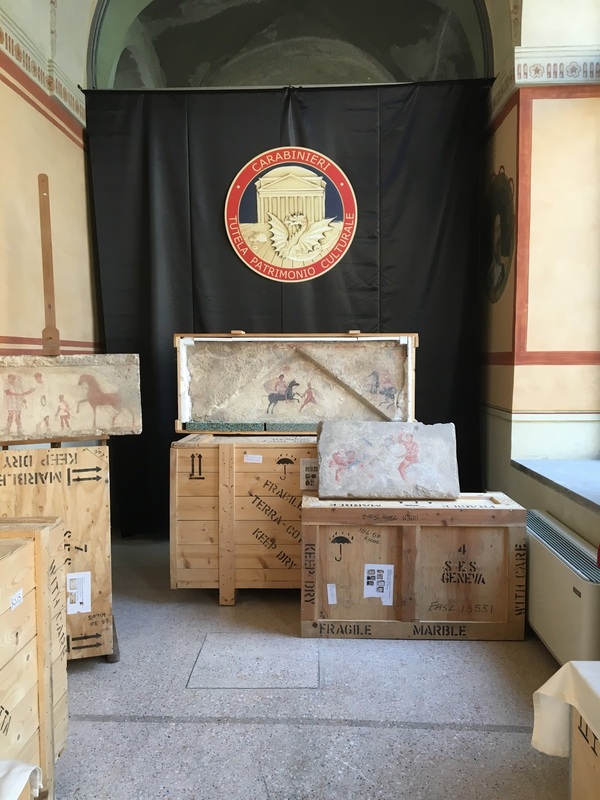 Capaldo stated that they believe that the statues, tiles and sarcophagi were to be illegally exported and sold under false papers to collectors in Germany, Japan and other various collector countries. 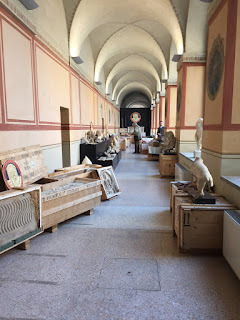 Stefano Alessandrini, a consultant to Italy's State Prosecutor and Cultural Ministry and a lecturer during ARCA's postgraduate program who lectures for ARCA's Art Law and Illicit Trafficking course says that it is impossible to give a precise financial figure on the value of material stolen from Italy over the last half a century, ie. from the beginning of the 1970s. Italian authorities believe that millions of objects have been illegally excavated and trafficked and some estimate the value of lost heritage due to antiquities looting to be as high as several billion euros. Alessandrini emphasized that when reporters ask for financial figures to indicate art's value they do not take into consideration the “priceless” aspect of an object: the loss of its historic information about the western world and the context in which the objects were found or how the tangible remains of antiquity gives us insightful information about ancient culture and civilisations. Alessandrini stated that only a small portion of the Italy’s looted art is ever located, and when it is, it is often only repatriated to Italy following lengthy litigation or extracted negotiations between the purchasers and the authorities in source countries. 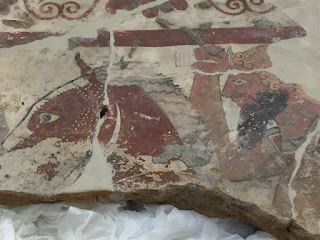 Alessandrini stated "When looted works of ancient art end up in foreign museums or are sold by auction houses and antique dealers we have a good chance to identify and recover them because we have photographs. 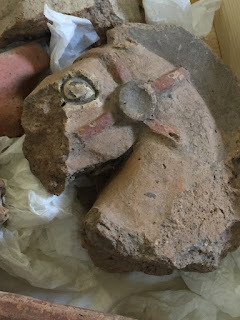 But many of the antiquities are still hidden in caches of traffickers like this one or in the collections of unscrupulous collectors that haven't been displayed publicly." 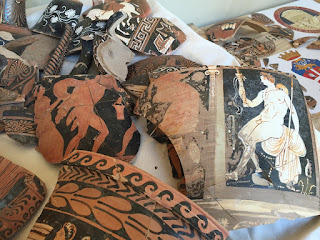 It is believed that the return of the this cache of looted heritage will increase pressure on Great Britain to hand over another 700 disputed artefacts linked to the same collector that are currently being held by the liquidator for Mr Symes estate following his declared bankruptcy. 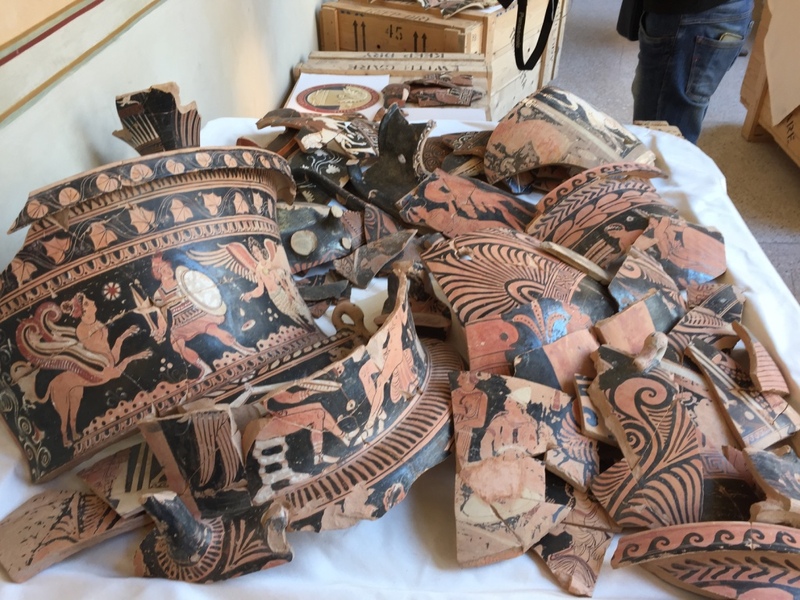 The UK cache of objects includes sculptures, jewellery and vases, most of which are believed by antiquities trafficking researchers to be Etruscan in origin and to have come predominantly from the Lazio and Tuscany regions of Italy. 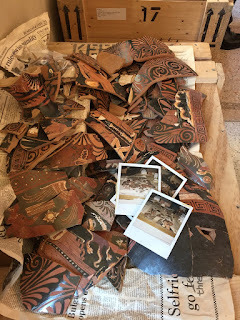 Why does a dealer or group of dealers appear to have an unending supply of archaeological material? 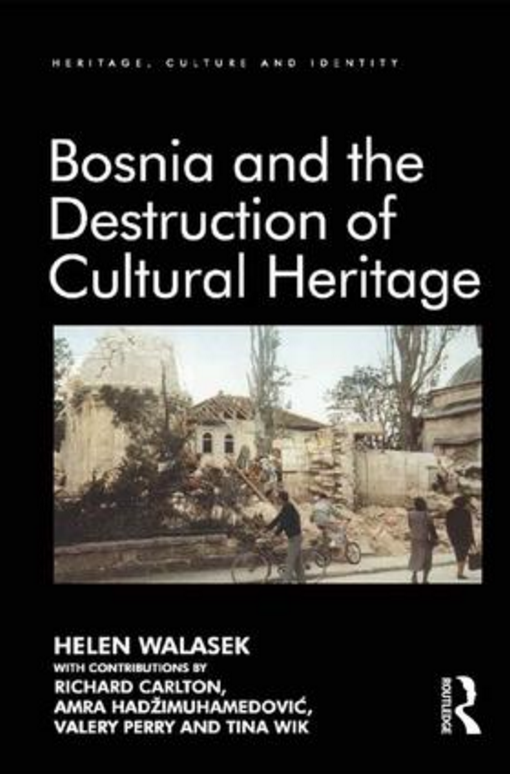 Should I spend large sums of money purchasing objects that destroy, scatter or obliterate it as a source of historical information giving us insight into the past? Will my purchase further more looting, theft, smuggling, or fraud? Could the proceeds of my purchase be used for nefarious purposes such as financing terrorism, militant activity or organised crime? 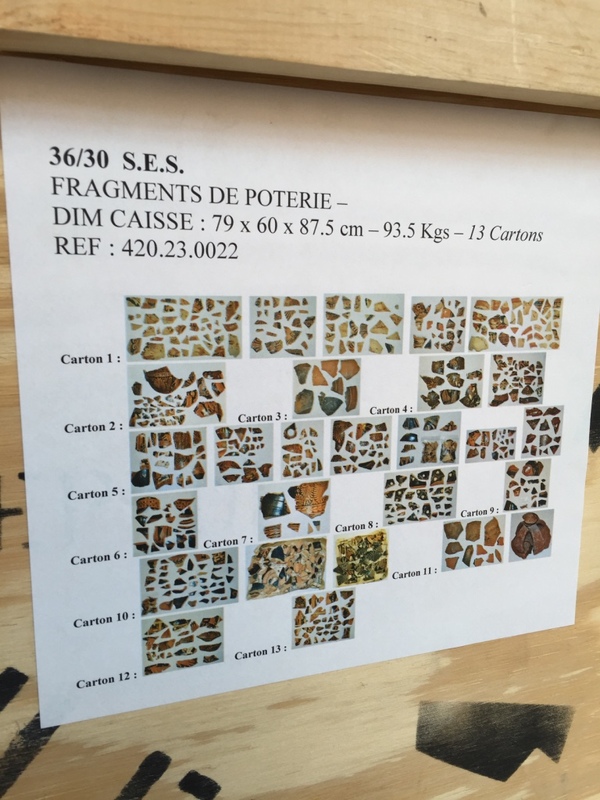 A partial sampling of images of some of the objects from the January 2016 Symes Geneva freeport seizure are included below. 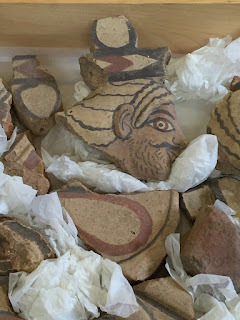 ARCA has maintained a complete photo inventory of all objects seized for research purposes. 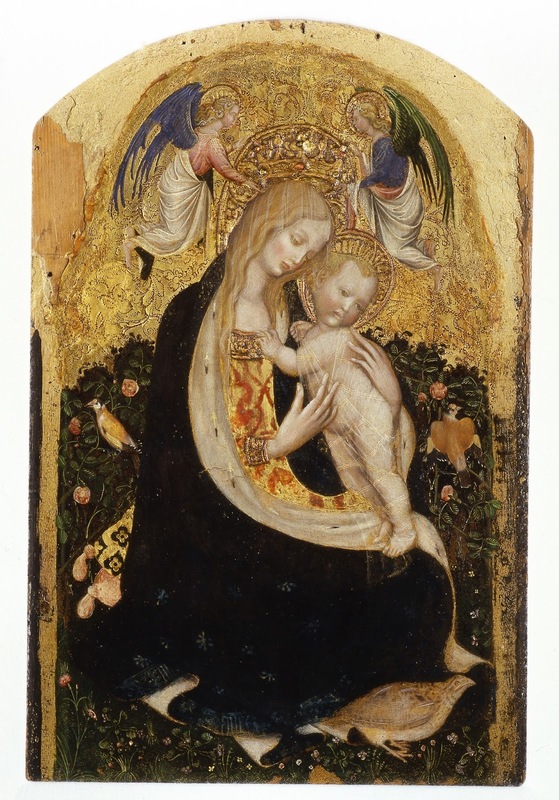 Surprising news continues to come out regarding the Thursday, November 19, 2015 theft from the Verona Civic Museum of Castelvecchio where thieves had made off with seventeen Italian and foreign artworks worth an estimated €10m-€15m including rare pieces by Peter Paul Rubens, Bellini, Pisanello, Mategna, the Venetian artist Tintoretto and his son. The Italian-Moldovan band, led by twin brothers Francesco and Pasquale Silvestri has been code named Operation Gemini after the two brothers found to be at the heart of the theft's organisation. 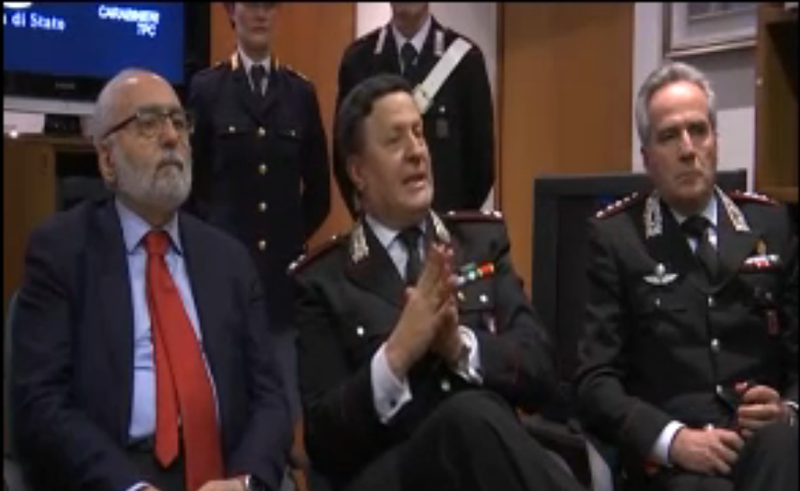 General Mariano Ignazio Mossa speaking on behalf of the Carabinieri TPC work in breaking the case indicated that his squad had been working in conjunction with local Verona law enforcement from the very beginning, arriving in the city from Rome on the morning after the dramatic theft. He stated that the law enforcement groups had worked together jointly and continuously from that day forward, without leaving the city throughout the four month investigation. With some bitterness in his tone, the general told members of the press that the specialised task force had intentionally elected to work on the developing case silently. This lips-are-sealed style of law enforcement is something sometimes criticised by the press, who clamour for the release of information from the moment a scandalous museum heist occurs. As a rule of thumb, the Carabinieri TPC has long been reticent about releasing much in the way of breaking news information when a major theft investigation is ongoing as the inopportune release of details sometimes serve as an impediment which can then compromise their ongoing investigation. Given the Italian art squad's successful history of recovery, the tactic has served them extremely well. General Mossa relayed that sometimes the media mistook the task force’s silence as a lack of attention to the severity of the theft, but in reality the decision preserved the integrity of their investigation and allowed officers to work efficiently to develop the inculpatory evidence necessary to arrest the two Italian brothers as well as Pasquale's Moldovan partner Svetlana Pkachuck. Pkachuck is considered to be the link to the nine others from the the Republic of Moldova, five of whom were reported to be residing in nearby Brescia where the museum guard's getaway car was reported abandoned. Authorities have indicated that the investigation was a laborious one that involved prosecution wire taps into the band's activities and the painstaking review of some 4,000 hours of CCTV footage. 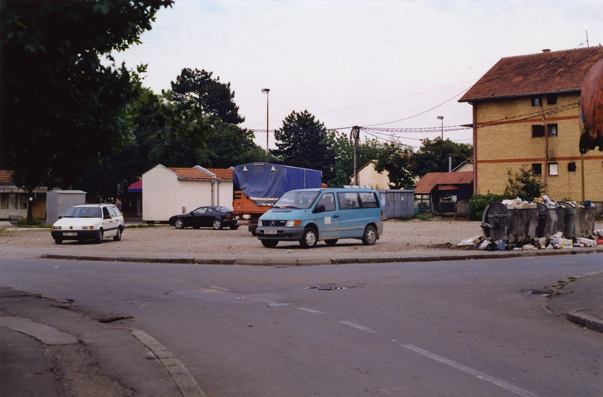 The biggest breakthrough came when the task force identified two Renaults driven by Moldovan members of the group. 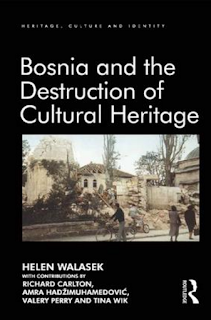 Based upon wiretapped conversations authorities believe that three or four of the artworks stolen by the Italian-Moldovan band of thieves were stolen from the museum specifically for one individual. The rest appear to have been grabbed opportunistically, possibly to be sold later, after the commissioned transaction had concluded. “We need to wait, its too much of a big mess” Pasquale Ricciardi Silvestri is said to have said during an intercepted wire tap. Some have speculated that the masterpieces may have been buried during the initial post-theft phase and then transported to Moldova. “We hope to recover works of art abroad. Arresting those responsible is the first step. We are confident we will recover them,” said an optimistic General Mossa. For more details please see the press conference video below with the prosecutor Mario Giulio Schinaia of Verona, the director of the SCO - the Central Operations Service of the Police - Renato Cortese, General Mossa commander of the Carabinieri for the Protection of Cultural Heritage, the commissioner Enzo Mangini and the provincial commander of the carabinieri Peter Oresta. Twelve accomplices, have been arrested in connection with the theft of 17 paintings worth an estimated €10m-€15m stolen on Thursday, November 19, 2015 from the Verona Civic Museum of Castelvecchio shortly before its 8 pm closing time. At the time of the theft, thieves had made off with seventeen Italian and foreign artworks including rare pieces by Peter Paul Rubens, Bellini, Pisanello, Mategna, the Venetian artist Tintoretto and his son. During the art heist, one accomplice stayed with the cashier holding her at gunpoint while two others escorted the watchmen through the museum's exhibition rooms and for more than an hour, removed artworks from their fastenings. The thieves were then reported to have taken the guard's keys, using his automobile for a fast getaway. Yesterday, law enforcement announced a sensational breakthrough in the case. 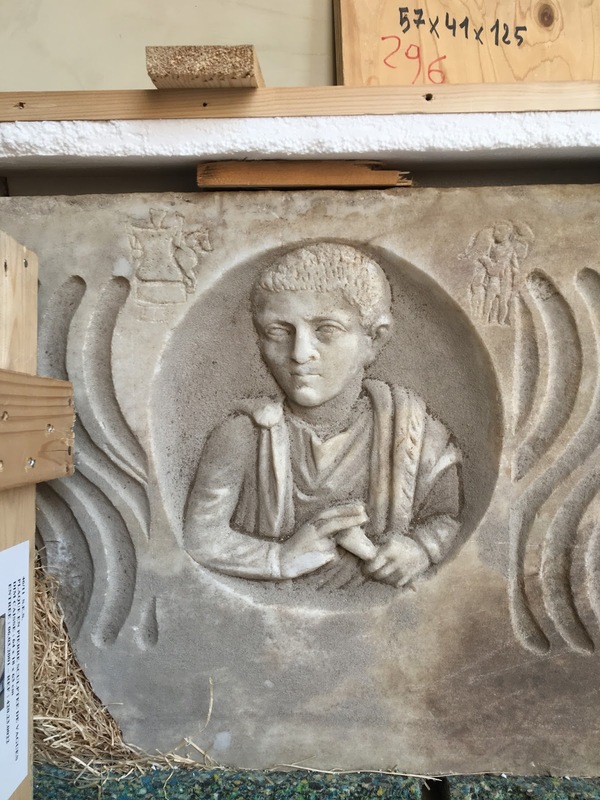 In a joint investigation involving Verona's Police and the Comando Carabinieri per la Tutela del Patrimonio Culturale coordinated by Italian Deputy Public Prosecutor, Gennaro Ottaviano, 12 accomplices have been arrested. Nine of those arrested were detained by authorities in neighbouring Moldova. Three accomplices were arrested in Verona. In what is developing to look like a classic insider job, one of the detainees, Francesco Silvestri, is the night security guard who had just started his shift at the Castelvecchio museum on the night of the robbery. Silvesteri's testimony at the time of the incident was not convincing. According to Italy's open public records, he told authorities that armed bandits had entered the side door of the museum just before closing time, a few minutes prior to the time evening alarms are activated. He then elaborated that the thieves quickly captured and disarmed him. For the next 80 minutes the thieves silently moved through the entire museum, cherry-picking select works. Caught on the museum's CCTV, the footage recorded the thieves only speaking three words before taking Silvestri's car keys and making a clean getaway with his vehicle. Silvestri was an employee of Securitalia, a firm that had been awarded the service contract to provide security and surveillance services to the museum. The guard is believed to have intentionally left the keys of his car available for the thieves to use during the museum heist. Also implicated in the theft is Silvestri’s brother and his Moldovan girlfriend who appears to have been the point of connection between the Italians and the Moldavians criminals who orchestrated the theft. 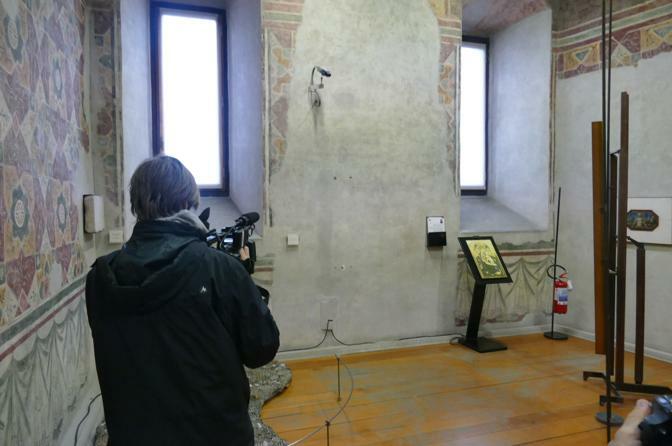 Announcing the arrest, Italy's Comando Carabinieri per la Tutela del Patrimonio Culturale released footage from the CCTV camera's taken inside the museum on the day of the theft. While the arrests are significant, authorities have issued no statements as to if any of the missing artwork has been recovered. 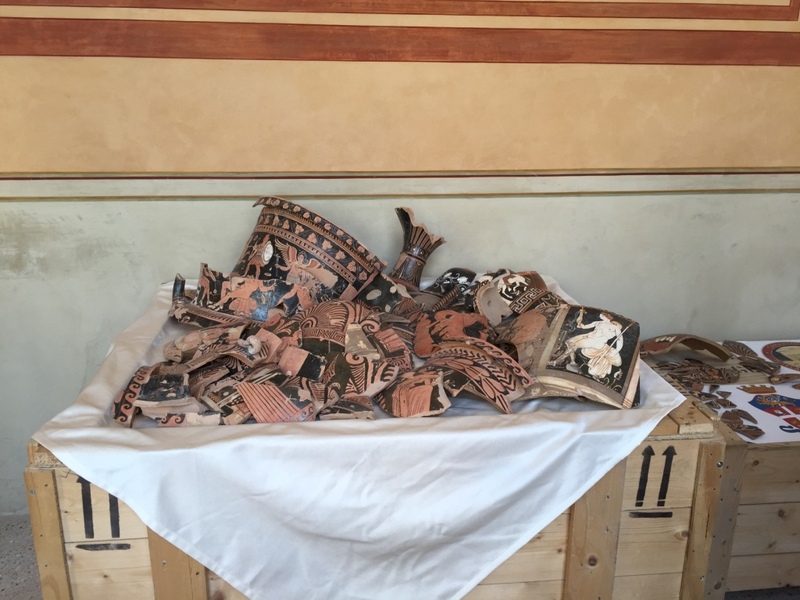 When queried by Italian journalists Verona's mayor Flavio Tosi stated "We hope to recover all the paintings and that they are in good condition." It should be noted that previous dramatic statements suggesting the involvement of Islamic militants in the theft seem to have been nothing more than unfounded conjecture.